Zumiez has been telling us for some time now, correctly I think, that they are approaching the number of Zumiez stores the U.S. market can support. They ended their January 31 year with 603 U.S. stores. No doubt they will continue to selectively open (and close) stores and there is certainly no exact number of stores this market will support. However, I’m guessing that the number has declined due to a weak economy, an over retailed market, and Zumiez’s omnichannel influenced “trade area” strategy. That strategy focuses on having the right number of stores in each geographic area given ecommerce and the way Zumiez’s customers are choosing to shop. Its focus is maximizing revenue in each area. Its premise is that opening more stores isn’t the only, or even the best, way to do that. But Zumiez is a public company. Growth matters, though CEO Rick Brooks (along with some other CEOs) is trying to get the Wall Street community to focus a bit more on the bottom line rather than the top. 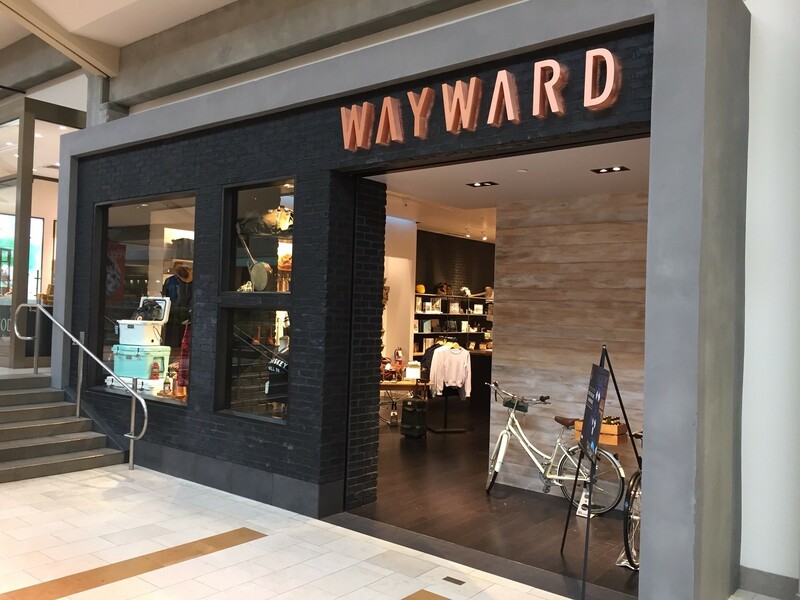 I guess after the initial shock you get when something new and different happens, I wasn’t that surprised to see Zumiez’s new concept store WAYWARD open in this Bellevue, Washington mall two stores down from the Zumiez store. Here’s a picture of the entrance. There’s no identification with Zumiez. The person I chatted with in the store wouldn’t even admit they were owned by Zumiez. The store can be best described as a boutique and very much fits the personality of this high (and getting higher) end mall. I swear I can’t afford to shop there. When I say boutique, I mean clean, crisp, modern finishes. Limited inventory displayed. No stacks of jeans or anything else. Apparel does not dominate. Lots of open space in the store. Each piece is presented individually and highlighted in its own space. I thought the lighting was key and well done. The common theme of most of the products is functionality and reliability in an outdoor activity. They better be reliable given how I perceived the price points. Not a lot of entry level product in this store. The products are all things you can imagine yourself using when you go on an adventure far and away even if, realistically, you mostly use the bike you can see in the front door to go down to Whole Foods for groceries. That sense of possible adventure is where Wayward it trying to get its coolness factor. And enough of the products are travel focused, or at least potentially travel useful, to validate that. By the way, there is now a Whole Foods store in this mall, where they will hold your groceries while you shop. It replaced part of the JC Penney that used to be there. Uniqlo and Zara have replaced the rest. While there is some overlap among brands at Zumiez and Wayward, the new store doesn’t feature any brand product displays with multiple products from that brand. It has very much cherry picked from the high end of certain Zumiez carried brands. I don’t really have a sense of how big the crossover is. I wish I’d spent a little more time checking out the Wayward brands because now, as I write about it, I’ve got questions. How many brands are exclusive to Wayward and not found in Zumiez? Is Zumiez planning to sell any of its owned brands in Wayward? How does the Wayward concept fit in with Zumiez’s stated and often described focus on identifying and helping new, up and coming brands? Will any brands in Wayward ever make their way to Zumiez? To what extent does Zumiez expect customer crossover between the two store concepts? Who is the target market? Walking the mall and seeing Wayward made me think about Zumiez’s traditional store layout and presentation. This whole mall is becoming, or arguably has become, upscale and boutique dominated (Hmmm. Wonder how long Macys will last there.). Zumiez’s stores are chocked full of merchandise both stacked and hanging and I think they all feature the ubiquitous wall of skateboards at the back. They aren’t hard do move around in, and Zumiez has always positioned itself as a full price retailer. Yet the look and feel of a Zumiez store is very different from a Wayward store (on purpose of course) and also very different from most of the stores in this mall. This distinction was highlighted for me when I visited the PacSun store. PacSun, having passed through its little hiccup with bankruptcy, cleaned up its balance sheet and become a private business, is also looking way more boutique like. They still had a stupid “half off on selected merchandise” sign almost blocking the front door, but once you got past that, you found a better merchandised, less crowded presentation. Dare I say it was almost boutique like? They can do that now because some of the financial pressure is off. With Wayward, Zumiez has certainly created a concept consistent with what the top end of the market wants. It’s completely appropriate to this mall and the people who shop there. But I was surprised to find myself wondering if the traditional (probably bad that I used that word) Zumiez concept would continue to work as well for this kind of mall. It makes me want to get more information on the target customer for Zumiez compared to Wayward and to think more about how the Zumiez’s concept of trade areas fits in. Zumiez’s Year and Quarter; What Are They Preparing For? I commend them for having a go at this. Everything comes full circle. While the merch and lighting are greatly improved at Wayward, this looks like a reboot of Abercombie & Finch from 1992. Back when A&F was Americana albeit now Wayward has a ton more accessories and fewer stacks of pants like back then. My question is who is shopping at REI and who is shopping at Wayward in the upcoming season(s). Clearly, their merchandising is greatly different between both businesses. Yeah, I think it’s a good thing to try too. Might have been even better if they’d started it a year or so ago, but I guess you don’t unleash a retail concept until you know the trend it’s based on looks like it might be around for a while. I see what you mean about A&F, but I guess my recollection of them back then was that they were less boutique like, less expensive, and almost completely apparel focused. So who is the market here? Certainly millennial is one answer. But it is also people with both the time and money not just to buy these products but to anticipate the kinds of activities the products imply. Or maybe these products come under the heading of “small luxuries” bought by customers (millennials among them) who aspire to some of these activities and implied destinations but can’t quite afford them or find the time right now? Or maybe the products get used for local, inexpensive activities (biking, hiking) and if you aren’t going far away on an adventure at least you have the product you’d have if you were and can use it locally. Like I’ve said before, we need to be careful not to just characterize customer groups by demographics in the age of perfect information and access for everybody. Your point about REI is a good one. It would be really interesting to compare customers between Wayward and REI.